"A patient suffering headache symptoms who was triaged (assessed) as suitable for a clinical call-back would have received an ambulance response prior to the change in code sets (priorities)," a spokesman said. "Our paramedics cannot give treatment to those patients with a DNR or provide the support their family needs at this difficult time," the spokesman said. "Sending an ambulance when we cannot clinically help the patient can extend the family's distress unnecessarily." 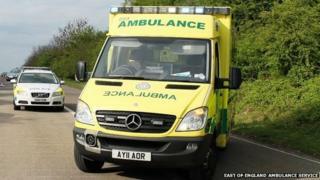 Denise Burke, a campaigner over poor ambulance responses in north Norfolk, said: "What is most shocking is the way patients who were near the end of life were treated. "We need to know whether their death was accelerated by the downgrading of the calls."